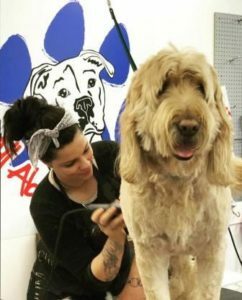 Alicia has been in the pet grooming industry for nearly 20 years. She has learned techniques from many different groomers. 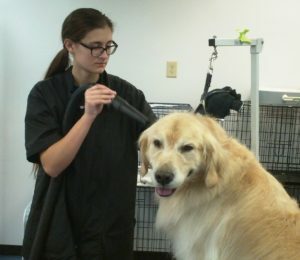 Alicia has participated in several grooming expos and educational seminars. She specializes in all breeds, but personally enjoys grooming mixed breed dogs. During her spare time she enjoys hiking with her dog and doing Yoga. Andrea started here in 2015, as a daycare assistant and kennel technician. She assisted in the grooming department as a bather while she attended grooming school. 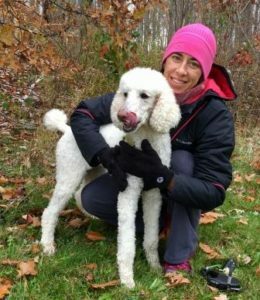 In September 2017 she completed the Basic Animal Grooming Certificate Program at Stautzenberger College. Andrea most enjoys "spending one-on-one time with the dogs and giving them extra love." She has 3 dogs; Sammie, a tea cup Aussie; Niko, a Shih/Tzu Yorkie mix; and a Chihuahua named Peety. Julianna began working here as a kennel tech and daycare attendant in March 2016. 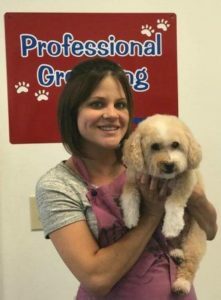 In September 2016 she joined our grooming department as a bather after completing the Basic Animal Grooming Certificate Program at Stautzenberger College. She loves “interacting with the dogs and getting to know them.” She has two Golden Retrievers named Piper and Fletcher. In her free time she enjoys training her dogs and competing in AKC agility and Skyhoundz frisbee! She also enjoys photography and puppy raising service dogs. Nina joined our grooming department in April 2017. She loves all breeds and sizes, a few favorites are Poodle, German Shepherd, Akita, Shih Tzu, Pit Bull and Bulldog. She loves Shih Tzu haircuts and has the most experience with Standard Poodles. The most rewarding part of grooming is the transformation of the dog and knowing that he feels much better and that you did a good thing! I love all fur friends and strive to make a positive difference in their lives!